The Minister of Information, Lai Mohammad, released the list during a press conference in Lagos on Friday. Mohammad said the individuals include officials in the past government. Mohammad said further that the APC will not stop talking about the alleged looting by the PDP. 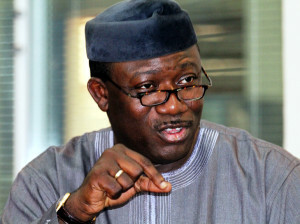 The Ekiti State Government has banned Dr. Kayode Fayemi, the Minister of Mines and Steel Development from holding political office in the state and other parts of the country for 10 years. This is according to a Government White Paper released in Ado Ekiti on Monday. The white paper was read to journalists by the state Commissioner for Information, Mr Lanre Ogunsuyi at the end of an emergency State Executive Council meeting. The white paper was the outcome of the report of the Justice Silas Oyewole-led Judicial Commission of Inquiry. The state government had set up the commission to look into the financial transactions of the state under the administration of Fayemi. It was mandated to submit its report on Dec. 13, 2017. Also banned for the same length of period along with Fayemi, was his then Commissioner for Finance, Mr. Dapo Kolawole. According to the White Paper, both Fayemi and his Commissioner for Finance have been declared unfit to hold any public position in the state and any part of Nigeria. They were also asked to refund various sums of money running into billions, either for failed or non-executed contracts that were allegedly paid for. It will be recalled that in Dec. 2017, when the panel submitted its reports, Fayemi and others, including contractors were asked to refund billions of misappropriated money to the state government. Specifically, Fayemi was asked to account for the whereabouts of N2.75 billion allocated from the N25 billion bond obtained by his administration. The money was for the construction of an ultra-modern market in Ado Ekiti, which was never executed. The commission also said that the contractor, in respect of the furnishing of the new Government House built by Fayemi should be made to refund N324.8 million. According to it, the furnishing contract should not have been more than N280 million. The panel said it found out that KITWOOD Nig. Ltd., to which the furnishing contract of more than N600 million was awarded had no traceable address. Also on the purchase of vehicles, the panel said “claim by Coscharis Motors that it supplied 235 and/or 250 vehicles was fraudulent and fraught with so many contradictions’’. In a statement signed by the Secretary to the State Government, Mr. Tunji Bello, the three affected cabinet members are Mrs. Adebimpe Akinsola, Mr. Femi Odubiyi and Mr. Anifowoshe Abiola. The Statement added that major deployments have also been effected. Muhammadu Buhari was elected as Nigeria’s president on a promise to root out rampant corruption in government that has seen billions of dollars of public money stolen over decades. But since his landmark election win in 2015 he has yet to secure a high-profile conviction for graft while the main opposition accuse him of mounting a political witch-hunt. Now, a growing scandal involving an indicted civil servant has engulfed the presidency, giving Buhari’s detractors fresh ammunition and raising questions about his grip on power. Last weekend, the Economic and Financial Crimes Commission announced that the interior ministry had reappointed Abdulrasheed Maina to the civil service. 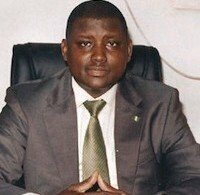 Maina headed a task force on pension reforms during the last administration but fled Nigeria in 2015 after claims he stole N2bn ($5.6m, 4.8 million euros). An Interpol arrest warrant was issued yet he still managed to return to Nigeria, where he has apparently since enjoyed armed police protection. Buhari, who it has been claimed knew about Maina’s return, responded by ordering Maina’s dismissal and arrest but the EFCC said he had again fled Nigeria to avoid being picked up. The opposition Peoples Democratic Party has predictably seized on the affair, claiming it showed the government’s fight against corruption to be “mere propaganda”. Ayodele Fayose, the PDP governor of Ekiti state who is eyeing the party’s presidential ticket in 2019, jumped on his favourite target — Buhari himself. “Fellow Nigerians, are you now convinced that Buhari’s anti-corruption fight is like Satan calling Judas Iscariot a sinner?” he wrote on Twitter. Buhari, 74, has spent much of this year in London being treated for an unspecified illness that has seen him undergo blood transfusions and a barrage of tests. He returned to Nigeria in August after months of speculation that he was seriously ill and rumours of a power struggle to succeed him if he were to step down or even die. For Clement Nwankwo, of the Policy and Legal Advocacy Centre in Abuja, “the bigger question (about the Maina affair) is how much control does the president have over his government”. Nwankwo said he was “worried that some people in the presidency would have the audacity to smuggle Maina… and even promote him without the president’s knowledge”. He pointed to hints from the president’s wife, Aisha, and one of his daughters, Zahra, about behind-the-scenes machinations and unchecked corruption at the heart of the presidency. In a Facebook post in July, Aisha Buhari alluded to “hyenas” and “jackals” surrounding the president, while Zahra called for an investigation of the presidential health facility. The two women’s aims in speaking out appeared to be “to simply ask Nigerians for help”, said Nwankwo. Even before the Maina scandal, Buhari was facing criticism for allegedly sitting on a report into claims of graft by Nigeria’s top civil servant and the intelligence agency chief. The report, into an alleged kickback scheme involving aid money for victims of Boko Haram and the discovery of $43m in cash at a Lagos apartment, was submitted in August. Debo Adeniran, from the Centre for Anti-Corruption and Open Leadership lobby group, said the Maina case was “a big embarrassment and shame to Nigeria”. “It shows that there are people in Buhari’s administration that are not committed to his ideals concerning the anti-corruption war,” he said. “By recalling Maina to the civil service after being implicated in a pension scam, this regime has put a big question mark on the president’s integrity. It has long been suspected that not everyone in government shared Buhari’s anti-corruption zeal but leading lawyer Femi Falana said the situation could still be salvaged. Maina should be located, charged and put on trial alongside anyone who helped him, he said. But while Buhari should be given credit for ordering an investigation, “follow-up action” was essential to show the public how serious his government is about tackling the issue. A total of N400 bn was received in bribes by public officials within a period of one year , the National Bureau of Statistics said on Wednesday . The NBS stated this in its National Corruption Report , adding that 32 . 3 per cent of Nigerian adults who had contact with public officials between June 2015 and May 2016 had to pay bribes to the government workers . The report , a copy of which was obtained by our correspondent in Abuja , was prepared by the NBS in collaboration with the United Nations Office on Drugs and Crime . It said the majority of those who paid bribes to public officials did so more than once over the course of the year . According to the survey , bribe payers in Nigeria pay an average of six bribes in one year , or one bribe every two months . By combining the total number of people who paid bribes to public officials with the frequency of the payments , the NBS report estimated that a total of 82 . 3 million bribes were paid in the 12 – month period . This , the report stated , resulted in an average of almost one bribe paid by every adult Nigerian per year . The report read in part, “Taking into account the fact that nine out of every 10 bribes paid to public officials in Nigeria are paid in cash and the size of the payments made , it is estimated that the total amount of bribes paid to public officials in Nigeria in the 12 months was around N400 bn , the equivalent of $ 4 .6 bn in purchasing power parity . The average sum paid as a cash bribe in Nigeria is approximately N 5 ,300 , which is equivalent to $61 – PPP . “This means that every time a Nigerian pays a cash bribe , he or she spends an average of 28 .2 per cent of the average monthly salary of N 18 ,900 . The NBS report said 85 .3 per cent of bribery cases in Nigeria were initiated either directly or indirectly by public officials , adding that almost 70 per cent of bribes were paid before any service was rendered. “With such a large portion of public officials initiating bribes , which are paid upfront , it seems that many public officials show little hesitation in asking for a kickback to carry out their duty and that bribery is an established part of the administrative procedure in Nigeria ,” it added . While money is the most important form of bribe payment in Nigeria , the report stated that other forms such as the provision of food and drink , the handing over of valuables or the exchange of another service or favour also existed . The report further revealed that 42 per cent of bribes in Nigeria were paid to speed up or finalise an administrative procedure that might otherwise be delayed for a long period or even indefinitely . According to the report , the second largest proportion of bribes is paid to avoid a fine through frequent encounters with police , while 13 per cent of all bribes are paid to avoid the cancellation of public utility services , an indication that the provision of the most basic amenities , including water and sanitation , can be subject to abuse of power by public officials in Nigeria . The report stated that law enforcement agents such as the police and judiciary workers such as judges and magistrates were the highest takers of bribe in Nigeria . It stated , “Police officers are the type of public officials to whom bribes are most commonly paid in Nigeria . Of all adult Nigerians who had direct contact with police officers in the 12 months prior to the survey , almost half paid the officers at least one bribe , and in many cases , more than one since police officers are also among the three types of public officials to whom bribes are paid most frequently in Nigeria . “At the same time , the average bribe paid to police officers is somewhat below the average bribe size . Other public officials with a high risk of bribery, according to the report , are car registration / driving licence officers ( 28 .5 per cent); tax and customs officers ( 27 . 3 per cent); road traffic management officials ( 25 .5 per cent); public utilities officers ( 22 .4 per cent); and land registry officers ( 20 . 9 per cent) . The wife of the President , Mrs . Aisha Buhari , on Tuesday left Nigeria for London , United Kingdom , to join her husband who has been on medical vacation since May 7 . According to a statement by her spokesperson , Bisi Olumide – Ajayi, the President ’ s wife thanked Nigerians who have been praying for her husband . The statement read , “The wife of the President , Her Excellency , Mrs . Aisha Buhari today ( Tuesday ) left for the United Kingdom . “ Her Excellency will spend some time with her husband , President Muhammadu Buhari , who is presently on medical vacation . 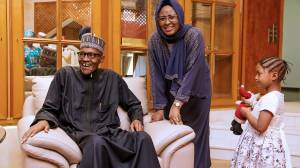 Mrs. Buhari ’ s journey came three weeks after her husband embarked on his latest medical vacation . The Special Adviser to the President on Media and Publicity , Mr . Femi Adesina , had announced shortly before President Muhammadu Buhari left the country that the duration of his stay in London would be determined by his doctors . The statement read , “ President Muhammadu Buhari proceeds to London tonight for follow- up medical consultation with his doctors . “ He had planned to leave Sunday afternoon , but decided to tarry a bit, due to the arrival of 82 Chibok girls who arrived Abuja earlier in the day . “ The President wishes to assure all Nigerians that there is no cause for worry . He is very grateful for the prayers and good wishes of the people, and hopes they would continue to pray for the peace and unity of the nation. “ The length of the President ’ s stay in London will be determined by the doctors . Government will continue to function normally under the able leadership of the Vice President .